Tony Joe White (born July 23, 1943, Oak Grove, Louisiana) is an American singer-songwriter and guitarist best known for his 1969 hit “Polk Salad Annie”; “Rainy Night in Georgia”, which he wrote but was firstly made popular by Brook Benton in 1970; and “Steamy Windows”, a hit for Tina Turner in 1989. “Polk Salad Annie” was also recorded by Elvis Presley and Tom Jones. 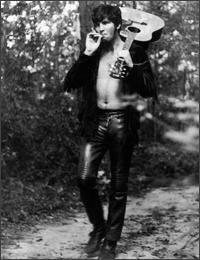 Tony Joe White was born one of seven children and raised on a cotton farm near the small town of Oak Grove, Louisiana. When Tony Joe was 16, Charles, the oldest of the White children, brought home a Lightnin’ Hopkins album and started teaching blues guitar to his younger brother. As a child, he listened to not only local bluesmen and country singers but also to the distinctive cajun music of Louisiana, a hybrid of traditional musical styles introduced by French-Canadian settlers at the turn of the nineteenth century. White began performing at school dances, and after graduating, started playing in nightclubs in Louisiana and Texas. He formed his first band, Tony White & His Combo, while still in his teens. The three youngsters (White, 20, bassist Robert McGuffie, 19 and Jim Griffith, 22) played a nightclub in Kingsville, Texas for an uninterrupted engagement of eight months (six nights a week) in 1964. That band was followed by Tony Joe and the Mojos and Tony’s Twilights, and for the next seven years White worked the small clubs of the South before deciding to embark on a solo career singing his own compositions. In 1967, White signed with Monument Records, which operated from a recording studio in the Nashville suburb of Hendersonville, Tennessee, and produced a variety of sounds, including rock and roll, country and Western, and rhythm and blues. Billy Swan was his producer. Over the next three years, White released four singles with no commercial success stateside, although “Soul Francisco” was a hit in France. “Polk Salad Annie” had been released for nine months and written off as a failure by his record label when it finally entered the U.S. charts in July 1969. It climbed into the Top Ten by early August, eventually reaching No. 8, becoming White’s biggest hit. White’s first album, 1969’s Black and White, was recorded with Muscle Shoals/Nashville musicians David Briggs, Norbert Putnam, and Jerry Carrigan, and featured “Willie and Laura Mae Jones” and “Polk Salad Annie”, along with covers of Jimmy Webb’s “Wichita Lineman”. Three more singles quickly followed, all minor hits, and White toured with Steppenwolf, Sly & the Family Stone, Creedence Clearwater Revival and other major rock acts of the 1970s, playing in France, Germany, Belgium, Sweden and England. In 1973, White appeared in the film Catch My Soul, a rock-opera adaption of Shakespeare’s Othello. It was directed by Patrick McGoohan and produced in the UK by Richard Rosenbloom and Jack Good. The cast included Richie Havens, Season Hubley, Susan Tyrrell, Bonnie Bramlett, Lance LeGault, Delaney Bramlett, and Family Lotus. White played and sang four and composed seven songs for the musical. In late September 1973, White was recruited by record producer Huey Meaux to sit in on the legendary Memphis sessions that became Jerry Lee Lewis’s landmark Southern Roots album. By all accounts, these sessions were a three-day, around-the-clock party, which not only reunited the original MGs (Steve Cropper, Donald “Duck” Dunn and Al Jackson, Jr. of Booker T. and the MGs fame) for the first time in three years, but also featured Carl Perkins, Mark Lindsay (of Paul Revere & the Raiders), and Wayne Jackson plus The Memphis Horns. Between 1976 and 1983, White released three more albums, each on a different label. Trying to combine his own swamp-rock sound with the popular disco music at the time, the results were not met with success, and White gave up his career as a singer and concentrated on writing songs. In 1989, White produced Tina Turner’s Foreign Affair album. Playing a variety of instruments on the album, he also wrote four songs, including the title song and the hit single “Steamy Windows”. As a result of this he became managed by Roger Davies, who was Turner’s manager at the time, and he obtained a new contract with Polydor. The resulting album, 1991’s Closer to the Truth was a commercial success and put White back in the spotlight. He released two more albums for Polydor; The Path of a Decent Groove and Lake Placid Blues which was co-produced by Roger Davies. In the 1990s, White toured Germany and France with Joe Cocker and Eric Clapton, and in 1992 he played the Montreux Festival. One of his more recent performances was on July 14, 2006 in Magny-Cours, France, as a warm-up act for Roger Waters’ The Dark Side of the Moon concert. White’s album entitled Uncovered was released in September 2006 and featured collaborations with Mark Knopfler, Michael McDonald, Eric Clapton, and J. J. Cale. * 1997 – Collection (RDM #D31737 – Australian) A collection from his ’91 -’95 releases.